This recipe is intended for breakfast, but by changing some of the spices would make another great meatball recipe as well as a great appetizer for a party. Normally sausage balls are filled with Bisquick but not these and they taste so much better. The Bisquick is just a filler, so lets skip that and get to the good stuff, the meat! 😉 This is a great go-to recipe for a quick, make ahead breakfast! I am really cheating on this recipe. I normally would make homemade breakfast sausage but with all the moving I just don’t have enough time to add one more recipe to the roster! Be sure and get the best breakfast sausage you can in the store, trying to avoid MSG. In the near future, I will posting a great breakfast sausage recipe! This is yet another recipe where a scoop is so handy. You don’t have to get your hands all messy, and I like that! Play around with the seasonings, if you want more pepper flakes, add it! If you want a bit of sweetness (mimicking maple syrup), add 1-2 servings of stevia. Mix meat and eggs together. Use small or medium scoop and place balls on foil lined baking pan (or measure 2 tbsp amount and roll into ball). Bake at 400 degrees for 15-20 minutes or until slightly brown. Store in refrigerator and reheat in microwave for 45-60 seconds.Nutrition: Basically none! The only carbs you get are from the cheese and it is insignificant over the entire recipe! Melissa, this was a winner in our house tonight! Hubby said, "I'd rather have these than the ones with the Bisquick!" Thank you!!! Glad you and your hubby liked them! Bisquick is just a filler to me. I like just meat and cheese! Make a few batches and they reheat so easy in the morning. This was so good. I doubled the recipe and added a little garlic powder. The kids couldn't get enough! Took some to work this morning and everyone was asking about what smelled so delicious! Thanks for posting this winner!! These are in my oven and are making my cabin smell divine on this rainy night! Can’t wait to bag ’em up and freeze for my morning breakfast-on-the-go…faster than the drive-thru (if you could get grain-free/gluten-free/sugar-free anything through a drive-thru)! Oh My! These look delicious. I am new to your newsletters and I saw all your Super Bowl foods and am very excited. This will be my first time making these foods for our family. thank you so much!! These look really good. Can’t wait to try them. I have both your cookbooks and everything I have tried is great. I am glad you are enjoying my recipes Sharon! These recipes are packed and so easy to shop for the ingredients, bring home and put together, I’m always thinking who would get a bang out of trying them. I’m excited and thrilled to have found them and so far it’s been grand time getting to eat them and have excellent results of increased energy, calm digestion and very flexible. Woohooo! So glad someone shared this link on Facebook and that I decided to check it out. My husband loves sausage balls. I can’t wait to try out this recipe as well as a lot of others I have looked over. Just bought both of your cookbooks for my kindle and so excited to start a healthier lifestyle for my family. God bless you and your many hours of hard work with your cookbooks and desire to help others. Caren, I hope you enjoy my recipes… I am glad to help! this looks delicious but not GF? thinking the breakfast sausage will have gluten so I will adapt it. I am confused as to why you say ”Nutrition: Basically none! The only carbs you get are from the cheese and it is insignificant over the entire recipe!” I should say there would be lots of vitamins and protein in the mix which is very nutritious. Did you mean something else? Dawn, yes, check your breakfast sausage to make sure it doesn’t contain gluten, most does not. 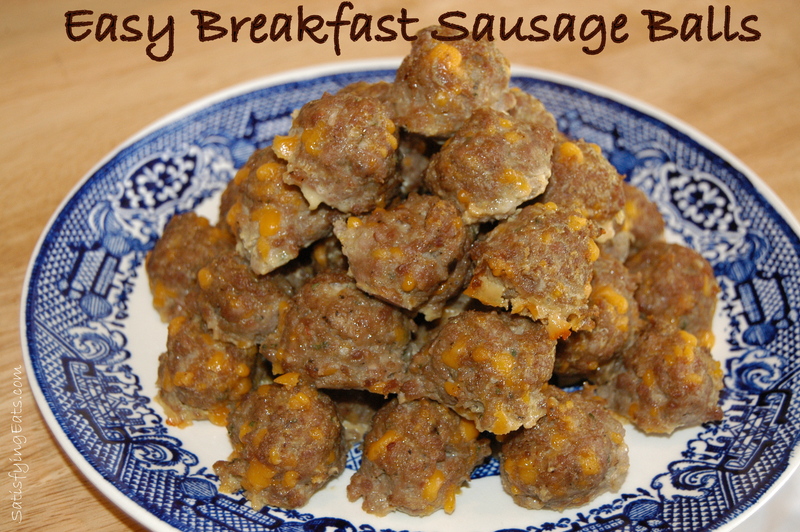 I also have a recipe for homemade breakfast sausage in my cookbook, Comforting Eats. For this recipe, I have only calculated the net carbs and that is what “basically none” means. Yes, they contains lots of protein from the sausage and cheese use. Hope this helps. Made the meatballs this past weekend and love them! Very hearty with a glass of whole raw milk. 🙂 Have a nice bag of them in the freezer to pull from when needed. THIS ANALYSIS IS DONE WITH GROUND TURKEY AS THE 2ND INGREDIENT: CAN’T WAIT TO TRY IT.